August, 2003 / Captain W. Russell Webster / Comments Off on Madaket Millie to the rescue! The Coast Guard welcomes new civilian volunteers to its Auxiliary to perform its many important missions, especially in the aftermath of September 11th when they have never been needed more. Auxiliarists come in all shapes and sizes, and barring a criminal record, all US citizens can make a difference regardless of their skills. 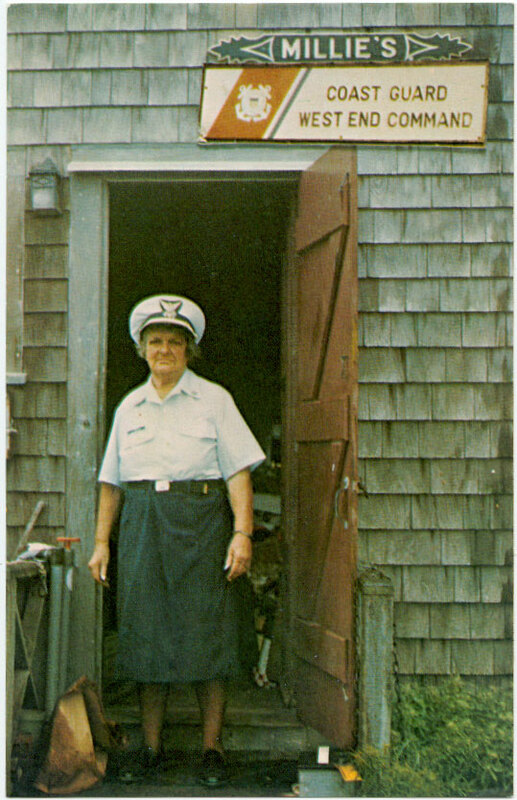 A good example is one of the Coast Guard’s most peculiar, and patriotic volunteers, Nantucket Island’s legendary Mildred Carpenter Jewett, affectionately known as “Madaket Millie,” (1907-1990). Even though she lived on a small island 30 miles off Massachusetts’s Cape Cod, she proved to be a consummate patriot, volunteer Coast Guardsman in eight different decades and an unfaltering friend to those in need, both animal and human. Madaket Millie was a curmudgeonly curiosity to the Nantucket tourists whom she coined “Mop heads” because of the noisy contraptions they drove. But to most islanders, celebrity or not, and especially the Coast Guardsmen she cared deeply for and served alongside for more than 75 years, she was soft to the core. This, despite a hardened exterior that lifted a 283-pound driftwood log, killed a 300-pound menacing shark with a pitchfork and drove away a mail order husband — twice. Millie was born on September 24, 1907 at Nantucket. Millie’s family moved to her grandmother’s farm in Madaket Village at the western end of Nantucket in 1911 when she was four years old. 1 Some stories tell of her doing chores for the nearby U.S. Life-Saving Service 2 Station Keeper and his family this same year. Enamored with the ocean, its mystery and strength, Millie would often sit atop her house and gaze out to sea for hours. Millie’s education was limited by her father’s long work hours, and Madaket’s isolation, eight miles from Nantucket’s school. Most of her education came from listening to her grandmother read aloud, while Millie and the adults shucked scallops. Millie’s number one challenge was to obtain enough meat for her Shepherd and Pinscher pups who had to weigh 60 pounds around the time of their first birthday to be eligible for more advanced training. She did this by sacrificing her own meat ration, an extremely scarce commodity. 15 Millie trained six dogs and had 13 more in training by the end of WWII. While Millie was training her war dogs in 1945, she watched as four Coast Guard recruits inspected a large log on the beach. The young men’s efforts to lift the driftwood, including sliding their hands under it and encircling the trunk and heaving in unison — failed miserably. Millie walked over to the log and said, “Stand back, and let an Islander try it.” By this time, a small crowd of onlookers watched intently. By 1946, the Coast Guard, convinced that new radio and radar technologies made it unnecessary for more than one rescue station in an area, closed Madaket Station. It was a sad day for Millie. Convinced of the need for a presence at Madaket, she remained vigilant for those in distress. Initially, Millie thought it was a serpent. All that she could see was the fish’s fin sticking six inches out of the water. Children were swimming nearby, and she knew she had to do something, so she set off in a skiff with the only weapons she had, a pitch fork, a rake and superhuman strength built up from years of shucking scallops. A neighbor in a powerboat helped corral the leviathan and in Millie’s own words, she “stuck a pitchfork in him and it goes ‘boom!’ — nothing happens. Their skin is too tough. I don’t know if it’s tougher than mine cause I never stuck a pitchfork in mine. But, it’s some kind of tough, I know that,” 29 Millie opined. Part of the broken fuselage ended up in Millie’s yard as the crippled craft sputtered overhead. Millie immediately pinpointed the crash site and alerted rescuers, who saved the plane’s navigator and sole survivor, Lieutenant Joseph Guenet, who was miraculously ejected from the fuselage as it broke in two. Nineteen seventy-five was a banner year for Millie. In April, she was authorized to fly weather-warning flags for the Coast Guard at her home. Local fishermen greatly appreciated this service, which she performed with one caveat — she would fly the flags when she wanted and how she wanted. 35 By this time, she had 65 years of experience observing and predicting the winds and seas and needed no direction. Millie had a wonderful sense of humor. 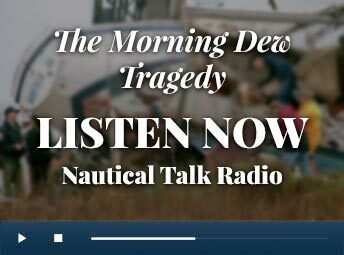 One former Brant Point crewman, noted “she scared the newest crewmembers without even trying.” As part of her weekly ritual visits to the station, two personnel were dispatched to pick her up. Sometimes, Millie would grab a new crewman by the shoulders and plant a “long, wet kiss right on the lips.” Seasoned crewmen knew that once Millie had you in her grasp, “you were not going to break her grip.” 38 The Old Salts did not immediately tell the rookies that all they had to do was salute Millie as soon as she came to the door and she would salute back, forgetting about the kiss. Each time a crewman departed the station after a successful tour, they would be given a crisp five-dollar bill and a sharp salute. 39 Captain Bill Nolan, USCG (Ret. ), the regional commander from 1981 to 1984, recounted a close encounter with Millie. During his departure ceremony, and a rare trip off island for Millie, she was so happy for Captain Nolan that she gave him the “wet one” and a five-dollar bill. And, the gifts didn’t stop there, as Captain Nolan later noticed that dog-lover Millie had given him fleas, too! Despite this thin veneer of vulgarity, Millie routinely kept an eye on the homes of many ordinary people when hurricanes or strong Nor’easter gales threatened. She also took care of those who opted to stay behind and ride out the storm. After being diagnosed with a brain tumor in 1981, submitting to one off-island surgery and lengthy stay in Boston, Millie’s condition worsened in early 1990. She refused needed follow-on treatment, opting to spend her final days near the people, animals and place she loved most. She died March 1, 1990 at the age of 82, having assisted the Coast Guard in one capacity or another for more than 78 years. She was not alone in her final days. Millie would have loved the March 24, 1990 remembrance ceremony the Coast Guard organized in her honor. More than 300 people from all walks of life, from seaman to admiral, from laborer to lawyer, and politician, attended. A military ceremonial platoon rendered honors and a bugler played taps. Flags at Coast Guard facilities on were half-masted in her honor. But, most of all, she would have loved her final helicopter ride which had been among her last wishes. Coast Guard records indicate Millie was evacuated from the island by their aircraft at least twice. Each time, she insisted on wearing her dress uniform and that the aircraft take the shortest route back when returning her to her cherished Madaket. At the end of the remembrance ceremony, the Coast Guard helicopter crew carefully spread her ashes over Hither Creek, forever commending her to the place she loved so dearly. All that remains of Millie’s belongings are a few artifacts in a local museum. But the legacy of the woman who dedicated her life to the safety and security of others will live on in the hearts and minds of the hundreds of people she touched. Her selfless devotion to her country and those in distress, despite adversity, remain an inspiration for Americans in the post 9-11 era.